Silver Service Limousinesï¿½ beautiful 8 passenger Black Ford Ltd stretch limo, one of the many stretch limousines on our website www.silverservicelimos.com.au , was featured in Episode 9 of UnderBelly, which caused national interest when it began screening on 13 February 2008 on the Nine Network in all states and territories except Victoria, due to a court injunction.ï¿½ The series depicts the key players in Melbourneâ€™s criminal underworld, including the Moran family and their rival, Carl Williams.ï¿½ It was filmed primarily in Melbourne, at locations around the city where the real-life events occurred. Underbelly,ï¿½which no one in Melbourne has seenï¿½, is a 13-part Australian television mini-series series, based on the real events of the 1995ï¿½2004 gangland war in Melbourne as depicted in the book Leadbelly: Inside Australiaâ€™s Underworld, by Age journalists John Silvester and Andrew Rule. ï¿½The lead-up to Underbelly involved a heavy marketing campaign which covered radio, print, billboards and an increased online presence, including the use of social networking tools. ï¿½At a reported cost of $500,000, both this marketing investment and potentially millions of dollars in advertising revenue were claimed to be put at risk by the Victorian Supreme Courtâ€™s injunction, as the series was expected to attract 800,000 to 1 million viewers in Victoria alone. ï¿½The injunction was put in place to ensure that upcoming criminal trials were not unfair to the accuseds, because the series contained fictionalised re-enactments of several disputed events. ï¿½Underbellywas a critical and ratings success when ultimately aired, being described as â€œAustraliaâ€™s best ever crime dramaâ€. ï¿½The opening double episodes, which aired on 13 February, attracted an average of 1,320,000 viewers nationally, minus Victoria. Every episode of the 13-part series was soon made available for download on a range of sites, with the Nine Network saying it was considering legal action. ï¿½The legal DVD of Underbelly was released on May 8, 2008, a day after the final episode was aired on TV. ï¿½Due to the legal suppression, the release was not able to be distributed through any retail or rental outlets in Victoria or on the internet. ï¿½The Nine Network has also approved a second series of Underbelly, and though details remain unclear, it is believed to be a prequel. In Episode 9, Suffer The Children, (screened April 09, 2008) Silver Service Limosï¿½ Black Ford Ltd limousine is featured.ï¿½ In this episode, Jason Moran returns from self-imposed exile, determined to destroy his rival Carl Williams.ï¿½ Whilst Death stalks a childrenâ€™s football match, the taskforce Purana finally gets the resources it needs to defeat the criminals.ï¿½ With Benji under constant police surveillance, Carl is forced to find a new accomplice.ï¿½ Carl and Roberta continue to try to live a normal life by celebrating their daughterâ€™s christening with a lavish party.ï¿½ Suffer The Children was rated 6th highest in the Underbelly series with 1.219 million viewers. For all your Melbourne limousine services contact Silver Service Limousines.ï¿½ Experience the 8 passenger Black Ford Ltd stretch limo as featured in Underbelly or any one of our fabulous range of luxury cars including the Melbourne party bus, various stretch limos to suit your every need, corporate transportation, superb Rolls Royce limousines, limousines for weddings, formals, debs, birthdays, staff parties, airport transportation, luxury car rental, and the amazing ultimate in stretch limousines, the hummer limousine. 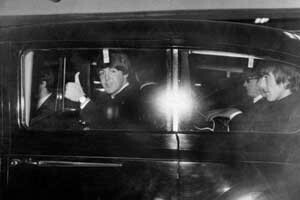 A piece of automotive, limousine and music history is available to you today through Melbourneï¿½s premier limo company, Silver Service Limousines!ï¿½ Itï¿½s more than forty years ago that Beatlemania came to Australia.ï¿½ In June 1964, John, Paul, George and Ringo were the biggest names in show business, fresh from their tour of the USA, they dominated the pop charts, at one time holding down the top six places.ï¿½ They were the ï¿½Brad Pittï¿½ of the ï¿½60s.ï¿½ On the 11th June 1964 ï¿½The Beatlesï¿½ arrived for what turned out to be their one and only tour Down Under.ï¿½ Silver Service Limousinesï¿½ 1959 Austin Princess, one of the many classic cars featured on our websitewww.silverservicelimos.com.au was the actual chauffeured car used by ï¿½The Beatlesï¿½ when on tour in Melbourne!ï¿½ Seating up to 7 passengers, the Austin Princess has a graceful saloon body, with tan leather interior and walnut trim.ï¿½ Ringo, who had been suffering tonsillitis, arrived after the Adelaide Shows and Jimmy Nichol was sent home with five hundred pound in his pocket and a gold watch. When The Beatles touched down in Sydney they were greeted by thousands of fans whoâ€™d braved torrential winter rain.ï¿½ More shows followed in Melbourne, Sydney, New Zealand and Brisbane, and the reception they got was just as ecstatic.ï¿½ Then in less than three weeks, it was all over ï¿½ The Beatles headed back to England.ï¿½ Within 18 months theyï¿½d tired of the screaming fans not being able to hear them play, so they quit live performances, and while hugely popular and influential albums followed until the band split in 1970, Beatlemania, as we knew it, was over.ï¿½ Although it lasted less than three weeks, many argue that visit fundamentally changed Australian attitudes to music and youth culture (comments by Eleanor Hall & John Barron).ï¿½ The Princess was originally Dallas Brookesï¿½ official car when he was Governor.ï¿½ So make your day a classic with the 1959 Austin Princess! ï¿½Silver Service Limoâ€™s has a wide variety of limousines, Chauffeured Cars and Stretch Limos. ï¿½Silver Service Limousines caters for all you limousine needs and occasions, including Debs, Formals, Weddings, Tours, airport transfers, chauffeured corporate car hire, wedding cars, bus, coach hire and charter, 4WD. ï¿½We provide a range of luxury sedan, corporate car, limousines, stretch limousines, Hummers, 4WD, mini van, bus, coach, classic and vintage cars.